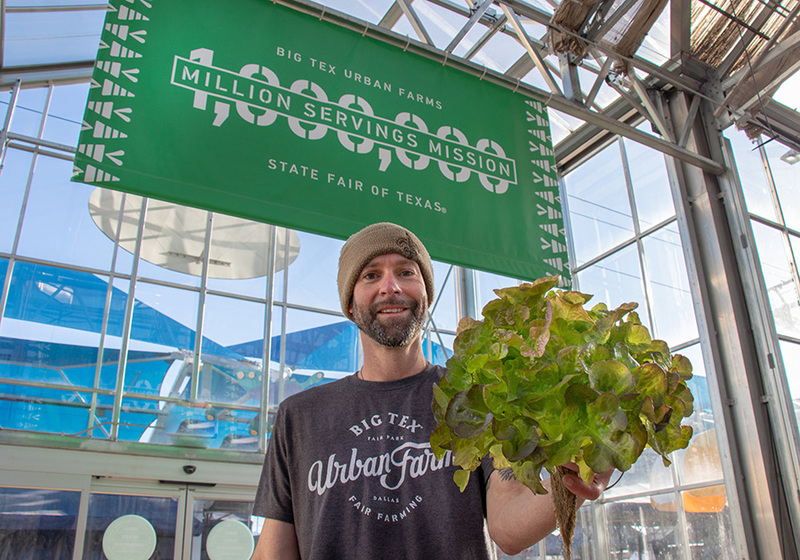 Big Tex Urban Farms and Hort Americas have partnered together to install, test and demonstrate a variety of hydroponic production systems while at the same time providing Dallas community organizations with locally-grown produce. Whether growers are producing vegetables, ornamentals or other hydroponic crops, Hort Americas is working to provide its customers with the products and knowledge they need to be successful. When Hort Americas in Bedford, Texas, started operating as a wholesale horticulture distributor in March 2009, the company had no existing customer base. What are the optimum nutrient levels for hydroponic edible crops? Trials with organic and conventional fertilizers in hydroponic production systems are showing it’s possible to produce edible crops at much lower nutrient levels. How much different is it growing edible crops organically than it is with conventional production inputs? Hort Americas special projects manager Tyler Baras is studying the differences in trying to grow organically versus using conventional production methods. Baras has been doing organic production research in a 12,000-square-foot greenhouse in Dallas, Texas, using four deep water culture ponds and a nutrient film technique system. The ponds measure 4-foot by 8-foot and are 10 inches deep. Baras said the ponds are smaller than what would be found in many commercial greenhouse operations, but said the pond size is common in vertical farm setups. Baras has been trialing commercial organic fertilizers including Pre-Empt and an experimental organic fertilizer. The organic fertilizers are being compared with crops grown with Hort Americas 9-7-37 hydroponic fertilizer with calcium nitrate and magnesium sulfate. All of the production systems have also been incorporated with the commercial microbial inoculant TerraBella. Crops being grown in the production systems include Italian basil, green butterhead and red butterhead lettuce. Trials in Hort Americas demonstration greenhouse are comparing the growth of butterhead lettuce and Italian basil using organic and conventional fertilizers in hydroponic production systems. Baras said the deep water culture production results he has gotten with Pre-Empt organic fertilizer have been comparable to the crops grown with the conventional Hort Americas hydroponic fertilizer. Baras said the electrical conductivity level in the organic fertilizer ponds has been as a low as 0.5 compared to 2.5 in the conventional fertilizer pond and the crops are coming out nearly identical in terms of production time and plant weight. One difference between the organic- and conventional-grown crops is the time in propagation. “The crops are finishing at the same time from transplant to harvest time, but we are keeping the plants an extra week in the seedling stage for the organic fertilizer,” Baras said. “We are running the seedlings for two weeks with the conventional fertilizer and about three weeks with the organic fertilizers. Plugs grown in organic substrates and fed with an organic fertilizer remain on the propagation bench one week longer than plugs receiving conventional fertilizer to ensure good root growth. Once the organic and conventional plugs are placed into the ponds, they both spend the same amount of time there until the crops finish. Baras said the plants grown with the organic fertilizers have also shown they can be grown with lower levels of other nutrients. For example, with the conventional fertilizer the nutrient solution may contain 200 ppm potassium and the level is only 12 ppm with the organic fertilizers. “Aquaponic growers have seen similar situations,” he said. “Some aquaponic growers may be running an EC of 0.7 with a relatively low nutrient level, but they are still seeing good growth. We are seeing that as well with the organic fertilizers. There are low nutrient levels in the solution, but the crops are coming out the same and the leaf tissue analysis is nearly the same as well. Baras said letting the organic fertilizer solutions age in the ponds may have an impact on the availability of nutrients for some crops. The aging of the fertilizer solutions also has an impact on increasing the microbial population. “We have definitely seen some differences in plant growth,” he said. “Our first crops of butterhead lettuce and basil did very well with Pre-Empt organic fertilizer. However, one of the other organic fertilizers we trialed grew a quality first crop of lettuce, but not the best looking basil. As we continued the trial with our second and third crops, the basil grown with the other organic fertilizer started doing much better. It appears the organic solutions in the ponds may need to age until the nutrients reach adequate levels. Aging of the fertilizer solution also has had an impact on the root growth of the crops. 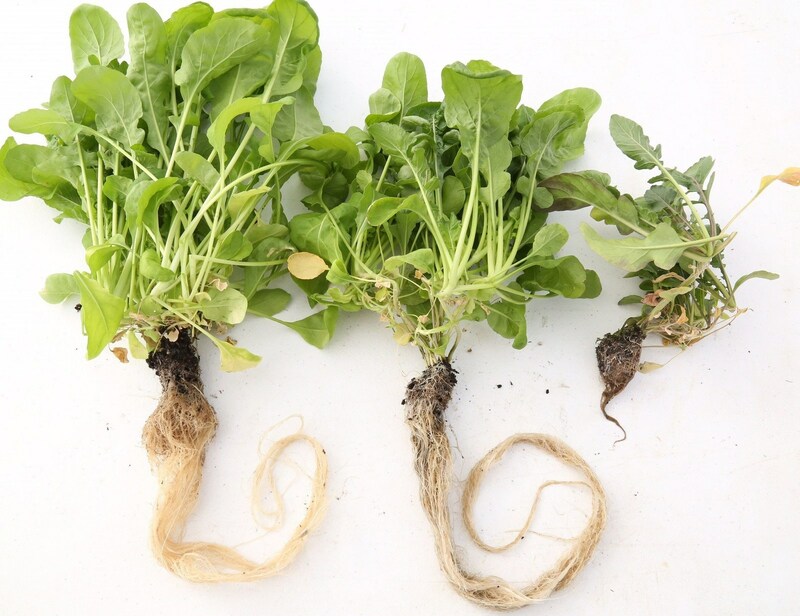 “When we compare how the roots look visually in the 9-month solution vs. the 2-month solution, the roots in the 9-month solution look much healthier,”Baras said. “The roots are very white, are longer and look really healthy and well-developed. There are also more roots on plants in the 9-month system. Aging of the fertilizer solution can impact root growth. Plants (left) in a 9-month old organic fertilizer solution had more roots that looked healthy and well-developed compared to the root system of plants in a 2-month old organic fertilizer solution. Baras said he has been able to produce healthy crops in a pH range from as low as 4 up to 6.5. “For hydroponic leafy greens the recommended pH ranges from 5.5 to 6.5,” he said. “We have basil and butterhead lettuce growing very well in organic systems at a pH of 4. On the other side of the pH range, I’ve heard of aquaponic growers growing these crops at a pH up to 7 without any problems. Based on our trial results some of the conventional recommendations for hydroponics for both pH and nutrient levels might need to be revisited. Baras said one factor that could affect the optimum pH and nutrient range is the light level. For more: Hort Americas, (469) 532-2383; info@hortamericas.com; https://hortamericas.com. David Kuack is a freelance writer in Fort Worth, Texas; dkuack@gmail.com. Tour of Hort Americas research and demonstration greenhouse in Dallas will show growers different hydroponic production systems for various vegetable crops. Growers of hydroponic vegetables or those considering starting growing vegetables hydroponically should plan on attending the AmericanHort Production Technology Conference. Scheduled for Oct. 9-11 in Dallas, the conference begins with a Technology in Action Tour on Oct. 9 which will visit three local production operations: Hort Americas research and demonstration greenhouse, Seville Farms and Southwest Nursery. Hort Americas, a horticulture and agriculture wholesale supply company, has retrofitted a 12,000-square-foot floriculture greenhouse for the hydroponic production of vegetable crops. Tyler Baras, who is the special projects manager at Hort Americas, is overseeing the trialing of five different production systems along with the testing of potential products for the company’s online catalog. The production systems include: nutrient film technique (NFT), deep water culture floating raft, a vertical hydroponic tower system, a flood-and-drain vertical rack system and a new capillary mat manufactured in Europe. The greenhouse is being used to grow a wide variety of lettuces, leafy greens, herbs and microgreens. During the AmericanHort Technology in Action Tour on Oct. 9, Tyler Baras, special projects manager at Hort Americas, will be talking about the five different hydroponic production systems he is trialing. The NFT system uses a new channel design. Baras said the narrower channels allow for the aging of crops without having to physically move plants from nursery channels to finishing channels. Hort America’s main floating raft deep water system is an in-house custom design that measures 32-feet by 28-feet. “We have tried using a Venturi system to incorporate oxygen, but for the last two months we have been doing trials with compressed liquid oxygen,” Baras said. “We have been doing trials to see how plants respond to increased levels of dissolved oxygen. This deep water system hasn’t been flushed in over a year. In addition to trialing crops in different hydroponic production systems, Tyler Baras is also studying a variety of crops grown with conventional and organic substrates and fertilizers. Baras is also studying how the water source can contribute to the nutrient level. In addition to the main deep water system, Baras said tour attendees will also see several smaller deep water culture systems. Another hydroponic system that Baras is working with is a vertical tower commonly used by smaller growers. “We have a lot of customers who use this system so we decided to install one in the greenhouse so we could look at some of the issues that they are dealing with,” he said. “We also were looking to answer some of the questions that our customers had about using the system. An example is can this system be used to grow organically? We’ve done both organic and conventional trials with this system. Hort Americas is also trialing a vertical Growrack from Growtainer. 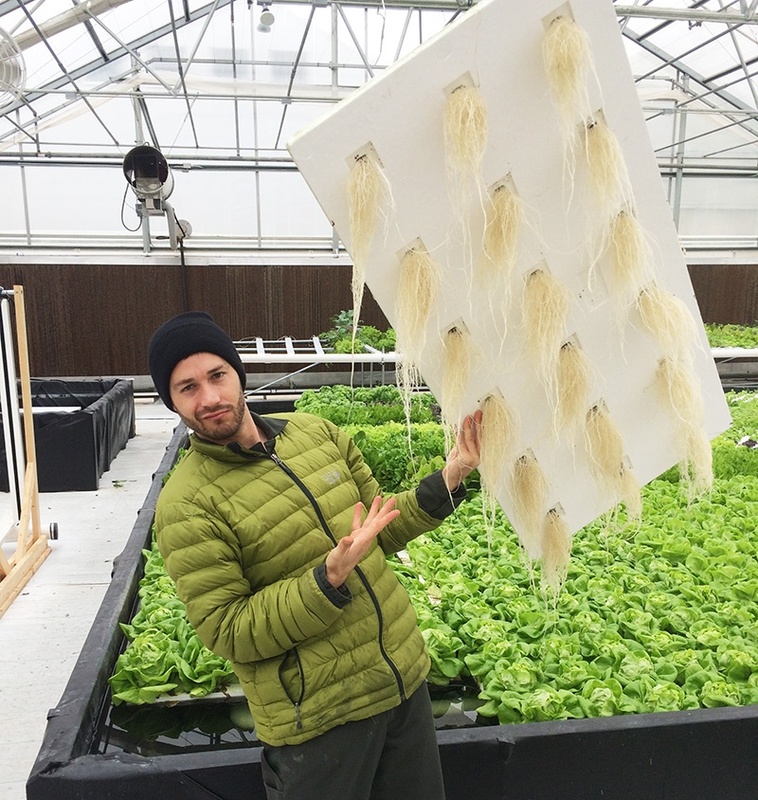 Although the Growrack hydroponic system can be used to grow full size crops, Tyler Baras is using it primarily for seedling propagation. Baras said the Growrack system, which is set up in the greenhouse, has done well in warm conditions because its water reservoir is below the rack. Although Baras has grown full size crops in the Growrack, it is being used now primarily for seedling propagation. “The focus of the system is how it has enabled us to cut back on the amount of space that is needed for propagation,” he said. “We can easily grow enough seedlings in this system for a 10,000-square foot greenhouse. Baras said he has grown both organically and conventionally with the Growrack system. 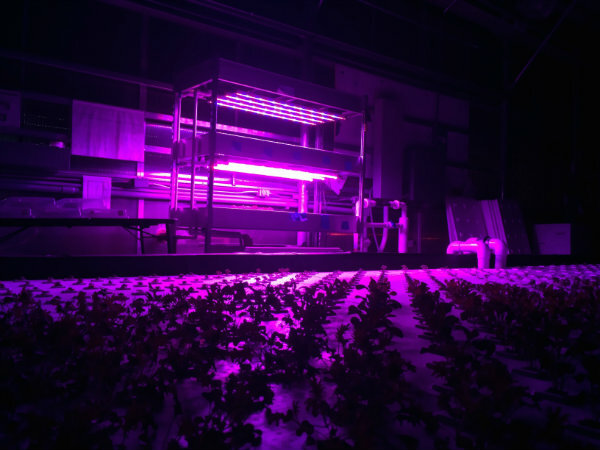 In addition to trialing LED lights vs. natural light for greenhouse seedling propagation and crop staging, Baras said he is also looking at using LEDs supplemental light throughout the production of butterhead lettuce in the floating raft system. “We are looking at how LED light affects leaf texture and plant morphology of butterhead lettuce,” he said. We are trying supplemental lighting during the summer. We are pulling shade so the light isn’t very intense. It appears that intense light can lead to tip burn that damages the plants leading to a poor quality crop. So we pull shade cloth and then run a prototype high-output LED grow light provided by GE for almost 20 hours. We deliver a low intensity of light over a longer period so we can provide the plants the light they need without stressing them. We are trying to improve the quality by adding LED light in order to produce more compact growth that is associated with LEDs. Baras said he is trialing a wide range of crops in all of the production systems he is using. “Primarily we are focused on lettuce and basil, but we are trialing a lot of varieties,” he said. “We definitely see some systems are capable of growing some varieties that other systems are not. We want to be able to recommend what varieties grow best in what systems. We are preparing a book based on our research that will include an entire section on strategies for how to use these production systems. We will provide example situations in the book discussing location, climate, market, what crops are being requested by that market and how to use that information to determine what production system is most appropriate. A vertical hydroponic tower commonly used by smaller growers has been installed to answer some of the questions that Hort Americas customers have about using the system. Based on the trial results, Baras said the book will provide details on each plant variety and its performance in each system. Even though the Greenhouse Lighting and Systems Engineering (GLASE) consortium is New York-based, the research it is doing has the potential to impact controlled environment agriculture worldwide. The Greenhouse Lighting and Systems Engineering (GLASE) consortium is a partnership between Cornell University in Ithaca, N.Y., and Rensselaer Polytechnic Institute (RPI) in Albany, N.Y. The consortium will be conducting research to improve controlled environment agriculture (CEA) operations including reducing energy consumption. The goal of the consortium is to create a more sustainable and profitable greenhouse industry. Although the focus of the research will be on greenhouse production, the findings should also have application to indoor CEA production including vertical farms and warehouses. Greenhouses, which can be electricity-intensive depending on the level of automation, cover 720 acres in New York State. The consortium is looking to reduce greenhouse electricity use and concomitant carbon emission by 70 percent and to increase crop yields by 2030. Erico Mattos, who was appointed executive director of GLASE in June, said he has been hired as a subcontractor by Cornell University and will be working to recruit industry members to join the consortium. Mattos said GLASE is a seven-year project which has received $5 million from the New York State Energy Research and Development Authority (NYSERDA). The money will be used to sponsor research between Cornell and RPI. The research activities include improving lighting fixtures and systems that synergistically control lighting, ventilation, humidity and carbon dioxide, improving CEA operations and reducing energy consumption to create a more sustainable and profitable greenhouse industry. The GLASE consortium is headed by researchers Tessa Pocock at Rensselaer Polytechnic Institute and Neil Mattson at Cornell University and GLASE executive director Erico Mattos. Mattos said in his role as executive director he will act as an intermediary between Cornell, RPI and NYSERDA making sure that the research is proceeding and that milestones are being completed on time. “The most important part of my position is to create a consortium with industry members,” Mattos said. “The goal over the next seven years will be for the project to receive less money from NYSERDA and more money from industry members. We want to establish a consortium that is self-sustaining. By bringing in industry members we will have money to do our own-sponsored research, technology transfer, outreach, and market research, all these types of things and GLASE will be self-financing. Mattos said the research that will be done at Cornell and RPI is complementary and will not overlap. “RPI will be doing more engineering-related research, such as looking at light fixtures and components including the drivers and controllers,” he said. 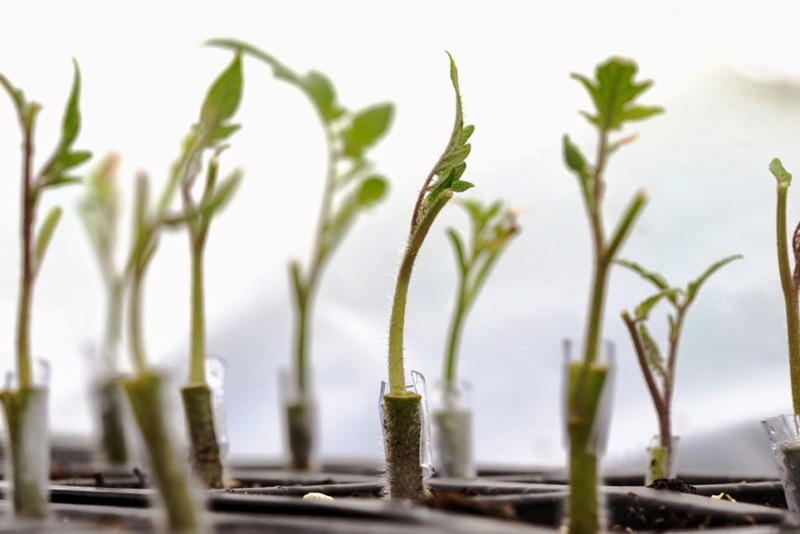 “They are also looking at photobiology—how plants respond to different spectra as they grow and produce different nutritional compounds and changes in plant metabolism and morphology. The RPI research work is more engineering-related. The research conducted at Cornell University will be more applied in the greenhouse, including carbon dioxide enrichment and lighting control studies. Mattos said the research will be expanded to commercial size greenhouses in New York, which will be 6,000 square feet for a small scale greenhouse and 20,000 square feet for a large scale greenhouse. “RPI will develop new systems and Cornell will implement the greenhouse tests and then move forward to a final demonstration,” he said. Mattos said the researchers will also be working in partnership with A.J. Both at Rutgers University, who will be doing some of the energy efficacy and radiometric studies of the light fixtures. Mattos said when GLASE was developed over 30 industry companies provided letters of support indicating they wanted to become part of the consortium as industry members. Since the consortium was started, many other companies have expressed their interest in becoming part of the consortium. Mattos said there will be a series of benefits that come with industry membership. “They would pay for a membership and then they would get a series of benefits. We are now working with a marketing media company to promote the consortium and the opportunity for membership. Mattos said it is the intension of the consortium to expand with researchers from outside New York. “We intend to establish future academic collaborations to develop new research projects partially funded by GLASE through industry membership funds and new research grants,” he said. Another goal of GLASE is to create a hub for greenhouse lighting and systems engineering which includes the centralization of information. “We will create a central database to indicate the academic research currently on-going in the U.S. (what, where and who) to facilitate the interaction between the industry and academia,” he said. The crops that are to be studied initially by Cornell and RPI researchers are tomatoes, lettuce and strawberries. “These are commercially relevant crops,” Mattos said “I went to Ithaca and met some of the members of Neil’s team, including graduate students Jonathan Allred and Erica Hernandez and research technician Matthew Moghaddam, who have been working with tomatoes and strawberries. Lettuce is also one of the most commonly produced greenhouse crops. The research conducted at RPI will be done in growth chambers and growth rooms, which should have application to commercial warehouse production. Although the RPI research is not targeted for commercial indoor farms, Mattos said the results could be used to support that type of production. “The proposal is to reduce greenhouse crop production energy consumption by 70 percent in seven years,” he said. “The economic factor and the majority of the research will be looking at greenhouse systems and how to integrate them. Economically we are focused on greenhouses. But we will be doing studies in growth chambers that may have application to support indoor farm production. For more: Erico Mattos, Greenhouse Lighting and Systems Engineering (GLASE) consortium; (302) 290-1560; erico.bioenergy@hotmail.com; https://glase.cals.cornell.edu. If you’re going to use a loose substrate in a hydroponic production system, you may have to change how you handle starter plants and the treatment of recycled water. Many growers of ornamental plants including annuals and perennials traditionally use a peat-based substrate such as 70 percent peat, 30 percent perlite. The growers, who produce these crops in containers, will often use the same substrates if they expand their crop offerings to include hydroponically-grown edible crops, including lettuces and leafy greens. When it comes to changing from conventional to organic hydroponic production methods, there are three main areas that growers find most challenging. Tyler Baras, special projects manager at Hort Americas in Bedford, Texas, said growers are increasingly inquiring about organic hydroponic production. Baras is running hydroponic production trials comparing organic and conventional production methods in a 12,000-square-foot research and demonstration greenhouse in Dallas. “We’re doing the research because of market demand,” he said. “A lot of growers are getting feedback from their customers that they would prefer to have produce that is certified organic. Produce suppliers and brokers hear from the grocery stores and then they bring those requests to the growers. Tyler Baras, special projects manager at Hort Americas, is comparing organic and conventional hydroponic production methods using a variety of edible crops. Baras said that organic production is a whole system that includes substrates, fertilizers and pest management. But most of the questions coming from growers about organic production are related to fertilizers. Baras said an advantage of traditional fertilizers is all of the research that has been conducted on them has enabled growers to target exact nutrient profiles for specific crops. “Research has enabled traditional fertilizers to come down to fairly exact levels,” he said. “Growers are able to figure out exactly how many parts per million of each nutrient they want to put into nutrient solutions. The chemistry allows them to be that exact. Another issue with many commercial organic fertilizers is they are animal-derived. These organic fertilizers include manures, bone meal, blood meal and feather meal. Baras has focused his research trials on Pre-Empt, a plant-derived organic fertilizer which has blackstrap molasses as its major component. He has been comparing organic vs. traditional fertilizers in several hydroponic production systems, including flood-and-drain grow racks, two different nutrient film technique (NFT) systems, deep water culture floating rafts and a ZipGrow Tower system. “We have successfully grown butterhead lettuce and basil in all of these systems using organic inputs,” he said. “We have several other crops that we are running through these systems in smaller trials, including spinach, cilantro, arugula, strawberries and other lettuce and herb varieties. Most of research is still focused on butterhead lettuce and basil. Baras said he knows of growers using Pre-Empt organic fertilizer who haven’t flushed their nutrient solution tanks for five months. Baras said the half rate of fertilizer and microbial inoculant are run through the system for about two weeks. “Once the microbial population becomes established, the nutrient solution in the tank can be brought up to full strength without any foaming or odors,” he said. Baras said one of the major issues with the organic nutrient solution during the first two weeks is pH swings. “The pH of the nutrient solution on the first day the organic fertilizer is added to the tank is in a good range around 6-6.5,” he said. “Within a couple days of adding the fertilizer, the nutrient solution pH shoots up to around 8.0. There are a lot of plants that do not like a high pH. Iron-inefficient crops like basil have a hard time taking up iron at a high pH. There will be a lot of chlorosis at the top of the plants. This happens within a couple days of the pH going above 7. Baras said growers have taken two routes to stabilize the nutrient solution pH. “There are growers who will let the solution go for this two-week swing and let the solution stabilize similar to what we have been doing,” he said. “Other growers are trying to control the pH with inputs. When the pH goes up they will add citric acid. When the pH starts to drop they will add sodium bicarbonate. Baras said the options for raising the pH are also limited. Baras said another issue with using citric acid and sodium bicarbonate for pH management is the longevity of the nutrient tank solution is shortened. Baras said once the nutrient solution stabilizes, the swings in pH won’t be as drastic when additional water and fertilizer are added to the tank. Another option for controlling pH includes adding more water or fertilizer. Baras said growers who switch to organic production systems should continue to measure the electrical conductivity (EC) of the nutrient solution to determine soluble salts levels. “A lot of the nutrients in organic fertilizers won’t register on EC readings because of the forms they are in,” he said. “They aren’t yet broken down into simple salts. If growers are basing their feedings solely on EC readings, the EC of the nutrient solution will probably read much lower even when sufficient nutrients are being provided to the crop. 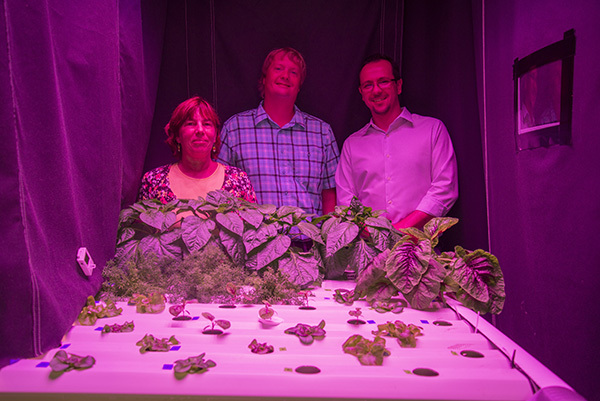 Butterhead lettuce and basil have been grown successfully in Hort Americas’ research greenhouse using several hydroponic production systems and organic inputs. Baras said plants are fairly flexible on many of the nutrients, which can be maintained within a fairly wide range. Baras said for fruiting crops like tomatoes, calcium can be an issue with organic production. “Calcium sulfate is an amendment that can be used to correct calcium deficiency,” he said. “Another nutrient that can be low with plant-based organic fertilizers is magnesium. What we have found is nutrients like calcium and magnesium that are usually lacking in the organic fertilizer we are using, they are generally found in the source water of most growers. Baras said that he uses an EC meter to get an estimate of the soluble salts level in the organic nutrient solution. “For lettuce the EC of the nutrient solution in the greenhouse for conventional production is usually run at 2-2.3,” he said. “For organic lettuce production I typically run an EC between 1.2-1.6. I make sure that the crop has the nutrients close to the target range by sending water samples to a testing lab to get an exact analysis. But even that has some issues with organic production. Baras has sent the same samples to multiple labs and he has received analyses with significant variations, especially with nitrogen. He suggests growers stick with one lab. “If there is a lab that is relatively close to a grower’s operation, this can help ensure that results are returned relatively quickly,” he said. “The best practice is for growers to create their own archive of the nutrient analyses so that they can compare test results to previous notes. Lab test results are likely mimicking what is happening in the nutrient solution tank. The microbes’ activities are also affected by temperature the solution is stored at as well. The readings could come out higher or lower. Baras said how often an EC analysis should be done depends on how large the reservoir is and how often water is added to the reservoir. Substrate trials in Hort Americas’ research greenhouse are looking at conventional and organic propagation substrates along with different irrigation strategies for producing healthy starter plugs for hydroponic production systems. Hort Americas has retrofitted a 12,000-square-foot greenhouse in Dallas, Texas, for the purpose of studying edible crop production in a variety of hydroponic production systems. The greenhouse is also being used to demonstrate products offered in the company’s online catalog. Tyler Baras, who is the company’s special projects manager, is overseeing the trialing of conventional and organic substrates in different production systems. Tyler Baras, special projects manager at Hort Americas, is overseeing the trialing of leafy greens and herbs propagated in conventional and organic substrates. The seedlings are transplanted into a deep water culture, NFT or vertical tower production system. “The trials I am focusing on are organic substrates vs. conventional substrates,” Baras said. “I’m primarily using stonewool or rockwool as the conventional propagation substrate. I am also starting to trial some loose substrates, including peat and perlite. For the organic production systems, Baras is working primarily with expandable coco plugs. He has also started working with some organic loose substrates including coco peat and perlite. For the substrate studies Baras is working with two standard hydroponic crops, basil and lettuce, primarily butterhead lettuce. A primary objective of the substrate trials is to determine the best irrigation strategies for both organic and conventional substrates. 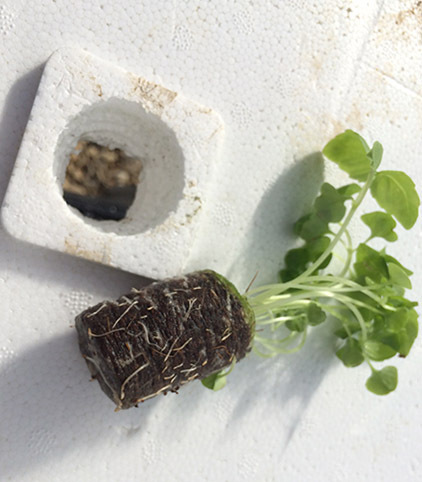 For the substrate trials, rooted seedling plugs are finished in a deep water culture, NFT (nutrient film technique) or vertical tower production system. Baras said growers who are moving from conventional to organic production tend to use the same irrigation techniques they employed with their conventional propagation program. “The growers will continue to irrigate the plugs a couple times per day,” he said. “With a lot of the organic plugs, when the seed is sown, they only need to be irrigated once every three days. If the plugs are overirrigated the roots don’t have an incentive to search out the water when they are planted into the production system. The search for water is what drives the seedling roots down to the bottom and out of the plugs. In addition to looking at the irrigation frequency of plugs during propagation, Baras is studying the impact of different methods of irrigation during propagation, including overhead and subirrigation. “When deciding whether to use overhead or subirrigation, it depends on whether raw or pelleted seed is being sown,” he said. “If pelleted seed is going to be used, a lot of times it’s advantageous to use overhead irrigation because it helps to dissolve the coating surrounding the seed. This helps to ensure the seed has better contact with the substrate. Sometimes it’s almost a little easier to get good germination with subirrigation if raw seed is used because of the direct contact with the substrate. 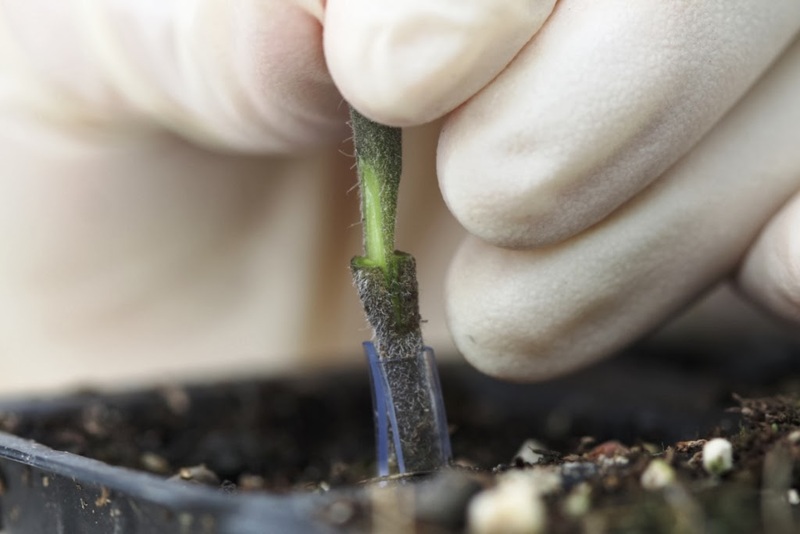 Growers need to avoid overwatering young seedling plugs or their roots may not make it down to the bottom of the plugs, which could delay transplanting into the production system. Baras said most indoor warehouse growers are not going to be using watering wands or overhead irrigation in their operations. “Most of the warehouse growers will be using subirrigation, such as flood tables,” he said. “For them it is going to be important that they select the right kind of seed to get good germination. They may have to try other techniques like using a deeper dibble or covering the seed with some kind of loose organic substrate such as perlite or vermiculite. Growers using overhead irrigation can usually sow pelleted seed without having to dibble the substrate. Baras said growers who are using automation, including mechanized seeders and dibblers, prefer to use pelleted seed. “With pelleted seed it’s easier to be more precise so that there is only one seed planted per plug cell,” he said. “I have seen automation used with raw basil seed. I have also seen organic production done where automation was used just to dibble the plug trays. Dibbling seems to be one of the biggest factors when it comes to getting good even germination. Baras said occasionally with tightly packed coco plugs, if the seed is not pushed down into the plug the emerging radicle may have issues penetrating the substrate. “This helps push the radicle down so it contacts the substrate and establishes more easily,” he said. “When subirrigation is used it can be advantageous to cover the seed with vermiculite or just brush the top of the coco plug after the seed is planted to get some coverage of the seed. Stonewool or rockwool is the primary conventional propagation substrate in the trials. Other loose substrates, including peat and perlite, are also starting to be trialed. Baras is also looking at using loose substrates in different ratios in plugs and then transplanting them into deep water culture, NFT, and vertical tower systems. 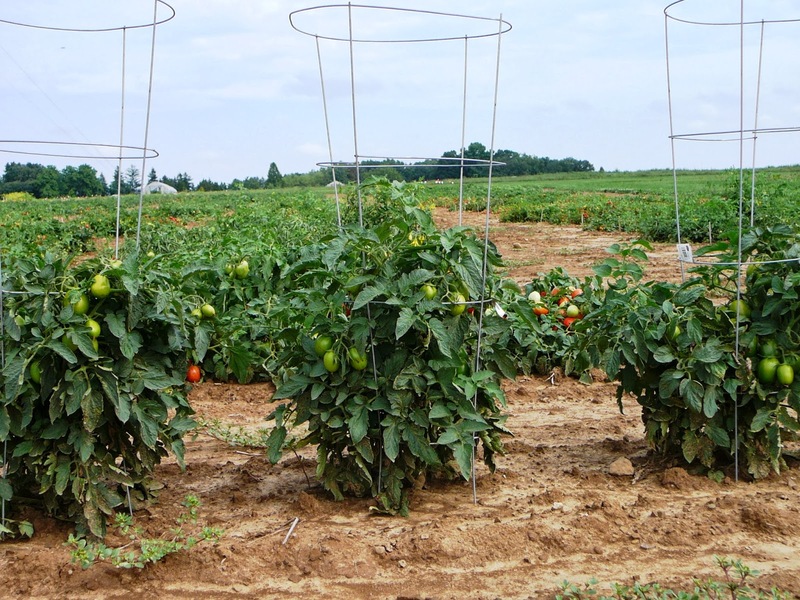 Early results from fertilizer trials in Hort Americas’ research greenhouse show knowing the levels of nutrients in fertilizer solutions can go a long way in avoiding problems with deficiencies and toxicities. Tyler Baras, who is the company’s special projects manager, is overseeing the trialing of leafy greens and herbs in five different production systems. “We’ve got a deep water culture or raft system using Hort Americas’ fertilizer blend with calcium nitrate and magnesium sulfate,” Baras said. “We are using that same nutrient mix in a nutrient film technique (NFT) system and a capillary mat system. 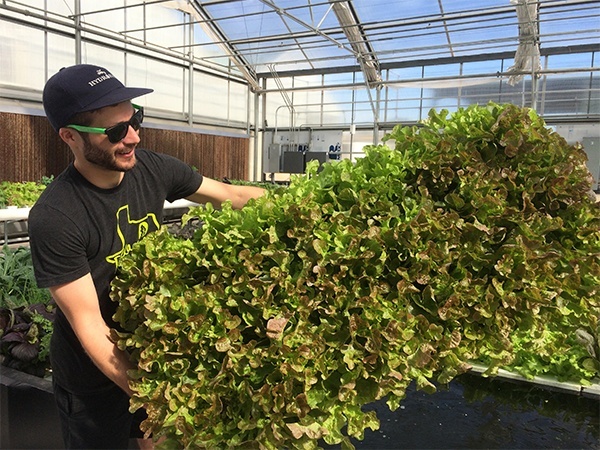 Tyler Baras, special projects manager at Hort Americas, is overseeing the trialing of leafy greens and herbs in different production systems, including deep water culture and nutrient film technique. Baras said the fertilizer recipe he is using in the deep water culture and NFT systems is based on general recommendations from Cornell University and the University of Arizona for leafy greens crop production. The deep water culture system has been running for three months. The water reservoir for the system is 8,000 gallons. The first trial with the NFT system, which has a reservoir of about 140 gallons, lasted for three months. One of the goals of the fertilizer trials is to see what salts are accumulating in the NFT system and to see how long the system can run before it has to be flushed. Baras said even with the changes in nutrient levels all of the plants have been performing well. “I haven’t seen any nutrient deficiencies or toxicities even as the fertilizer recipe has shifted over time. We have been trialing a wide range of crops, including butterhead and romaine lettuces, kale, spring mixes and basil. I’m trialing a lot of crops to figure out when these crops start to be impacted by possibly too much salt accumulation. I haven’t seen anything yet that is alarming. During the three months that the deep water culture system has been running the electrical conductivity (EC) has been very stable with plants showing no signs of nutrient deficiencies or toxicities. Baras said he has seen a slowing of plant growth in the NFT system. “I’m not seeing any deficiencies or toxicities, but the crops have slowed down about a week over the deep water culture,” he said. “Depending on the crop, it’s taking a week longer to reach either the plants’ salable weight or height. During the three months that Baras had been running the NFT system he never flushed the system. “All that I’ve done with the NFT system is add water and additional fertilizer to maintain a targeted EC,” he said. “One of the goals of the trials is to see what ions are accumulating in the system and to see how long I can run the system before it has to be flushed. When I started the target EC was 2.2-2.3. I still achieved the target EC at three months, but the composition of what was actually in the water changed. 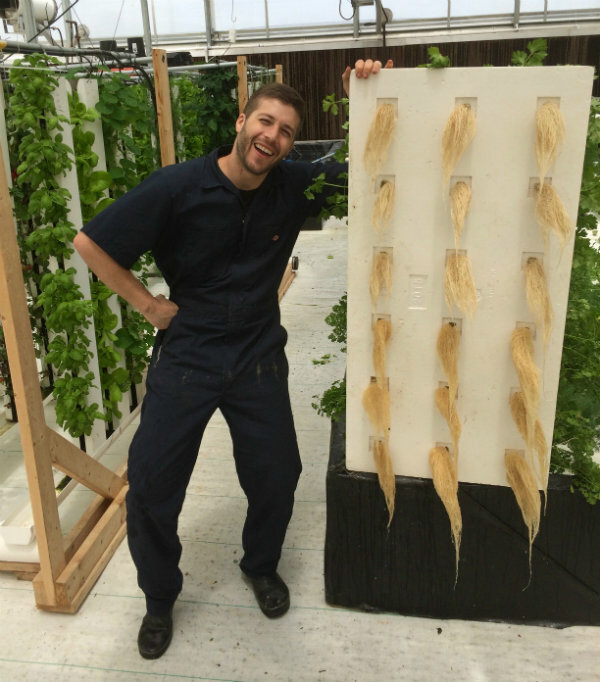 Baras is growing a variety of cut herbs in vertical grow towers. The plants are fertilized with Terra Genesis, a molasses-based organic fertilizer. He said Hort Americas has been hearing from tower growers who are interested in trying to grow organically. “What we are seeing is the organic fertilizer solution can change a lot over time,” he said. “The fertilizer tank solution matures as time goes on. With the organic fertilizer, the nutrients tend to balance out as the solution is run longer. “Our city water contains calcium and some magnesium. These elements are actually the nutrients that the organic fertilizer is slightly low in. So as I run the system longer, through the addition of city water, I actually start to see an accumulation of both calcium and magnesium, which actually helps balance out the total fertilizer recipe. The balance of the nutrients has improved over time. A variety of cut herbs are being grown in vertical grow towers and fertilized with Terra Genesis, a molasses-based organic fertilizer. Baras said one noticeable difference between the NFT, deep water and vertical grow towers is how much slower the plants grow in the towers. “I don’t know what to contribute the slower growth to yet,” he said. “It could be trying to determine the best fertilizer rate for the fertilizer. It could be the crop selection, because most of the crops in the towers are different from what I’m growing in the NFT and deep water culture. Baras said one of the issues that can arise with using organic fertilizer is the development of biofilm in the irrigation lines that can cause emitters to clog. “I am incorporating a product called TerraBella, which contains beneficial microbes,” he said. “These microbes help mobilize certain nutrients, like phosphorus, which can promote the formation of biofilms. 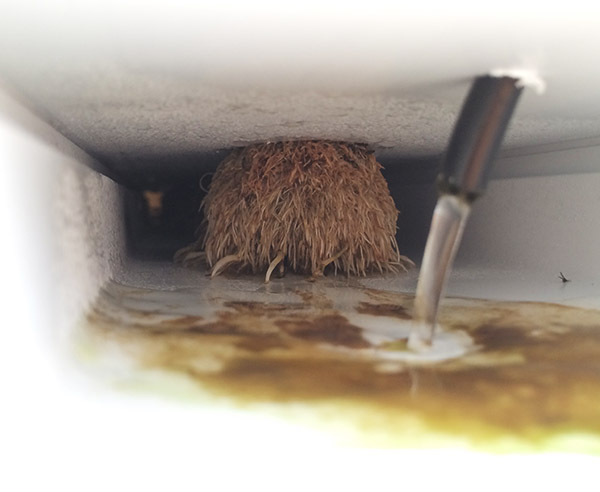 This biofilm buildup is usually more of a problem with high water temperatures. “About every six weeks I add a booster application of the beneficial microbes depending on the production system. The deep water culture system has a larger reservoir so I am not replacing evaporated water as often. For the other productions systems, like the NFT and grow towers, where I am replacing the water, I am incorporating the beneficials more often. For these systems, the fresh city water that is added dilutes the fertilizer solution. Also, there is chlorine in the city water that possibly could negatively impact some of the beneficial microbes. 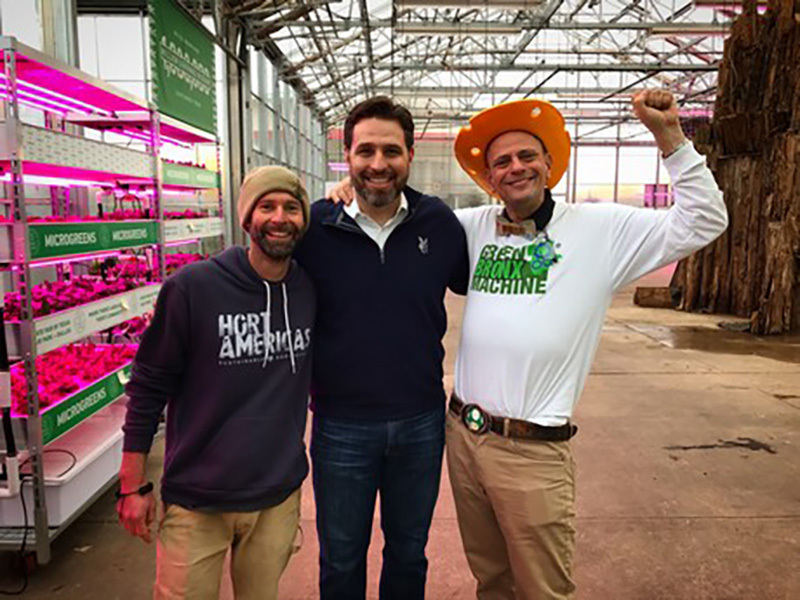 Hort Americas’ special projects manager Tyler Baras is using a 12,000-square-foot hydroponic greenhouse to teach company staff and customers what it takes to economically grow leafy greens and herbs. Tyler Baras is a well-traveled grower. He has worked in Florida and Colorado growing hydroponic greenhouse vegetables, including organic crops. He is now taking the knowledge and experience he has gained from those growing operations and putting it to use in a 12,000-square-foot demonstration and research greenhouse in Dallas, Texas. Baras, who is the special projects manager at Hort Americas, is overseeing the trialing of leafy greens and herbs in five different production systems along with the testing of potential products for the company’s online catalog. “Chris Higgins, the general manager at Hort Americas, brought me to the greenhouse and asked if I would be interested in running a demonstration and research facility,” Baras said. “He was also interested in collecting data and writing a book about leafy greens production. 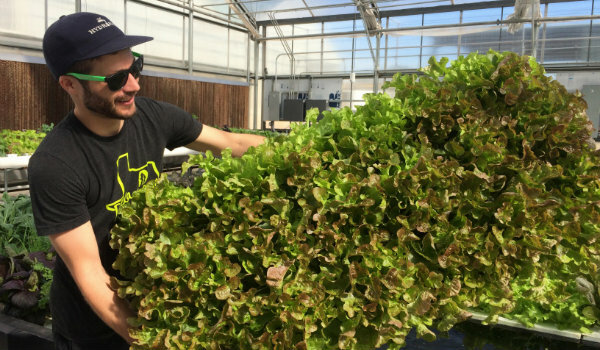 Tyler Baras, special projects manager at Hort Americas, is overseeing the trialing of leafy greens and herbs in five different hydroponic production systems. The retrofitted greenhouse is located behind a grocery store and prominent Dallas garden center. The grocery store and garden center will allow Baras to test his projected budgets and produce sales. Dallas was chosen for the research location because it is one of the hardest places to grow hydroponic leafy greens. Baras will be trialing primarily leafy greens, including a variety of lettuces (bibb and Romaine), kale, bok choy, basil and other herbs. Baras said he will be collecting a lot of data including: cost per plant size, how much does it cost over the production cycle to operate each system and the labor costs involved with operating each system. The 12,000-square-foot demonstration and research greenhouse contains five different production systems including a deep water culture floating raft system. “The goal is to collect data that can be used by everyone,” he said. “We are going to collect data that includes the total light delivered. If growers in more northern latitudes are dealing with lower light, they can look at the light levels we maintained in the greenhouse and reach those same levels using supplemental light so that they can mimic the exact same conditions. Baras said based on initial production results what makes most financial sense at this time is growing basil and lettuce. “Our initial metrics from the data that we have collected have been good,” he said. “We are producing 8- to10-ounce heads of bibb lettuce in 38 days and we are harvesting commercial size sleeved basil in 26 days from seed. Preliminary production results include harvesting commercial size sleeved basil in 26 days from seed. Having experienced a warmer than normal October, Baras said the water temperature in most of the production systems has been 85ºF or warmer. “Generally the water temperature for most hydroponic crops is between 65ºF-70ºF,” he said. “The water temperature here is definitely warm, but we are still having really great growth. So far it is looking like we can grow a crop during the summer. But we haven’t gone through a full summer yet and that is going to be the real test. 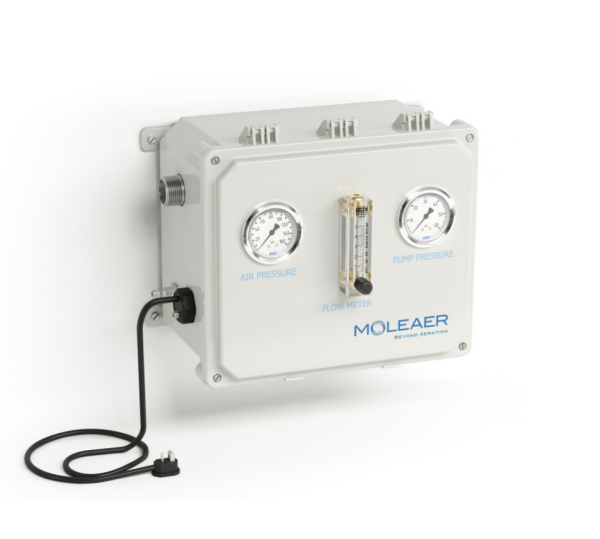 “We are trying to find ways around having to chill the water, including increasing the level of dissolved oxygen in the water using a variety of methods. This includes using Venturi aerators, and if needed, injecting liquid oxygen. These methods are less costly than running chillers. Chillers can be expensive and they use a lot of energy. Baras said the greenhouse has already been used for onsite training. “That is one of our main goals with the site,” he said. “We want to be able to bring in people and provide them with hands-on training, both our customers and the Hort Americas staff. For example, we want to be able to show them how to blend fertilizer, what the process looks like for moving seedlings through a hydroponic system, how to measure light levels in a greenhouse and best pest control methods. The greenhouse will be used to provide training to Hort Americas’ customers and staff, as well as the trialing of new products. The greenhouse will also be used for trialing new products. 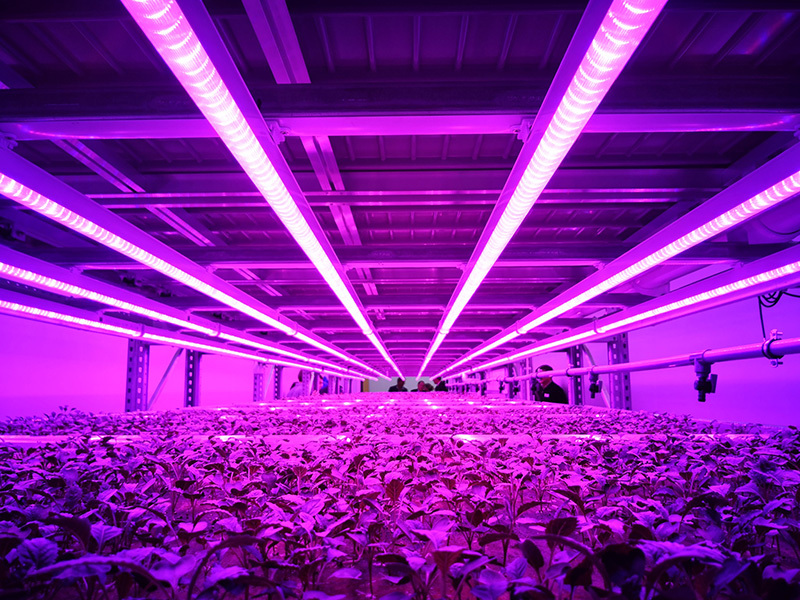 An agreement between Colorado State University and Philips Lighting to equip its new 27,000-square-foot horticulture center with LEDs will put the focus on using the lights for improving ornamental and vegetable plant production. When officials at Colorado State University went looking for property to build a new football stadium they didn’t have to look far. They decided that the land on which the 65-year-old W.D. Holley Plant Environment Research Center resided was the perfect location for the new stadium. “The old horticulture facility, which had been built in 1949, was considered a hot property by school officials,” said Steve Newman, who is greenhouse crops extension specialist and professor of floriculture. “To replace the old site, the university provided the department with a new $7.5 million 27,000-square-foot research and teaching facility. There is also a 3-acre outdoor area for plant trials. The horticulture center’s new greenhouse is a Nexus Vail model frame which is covered with Thermaglas polycarbonate. It is equipped with Ludvig Svensson retractable heat curtains and Wadsworth Control vents, Modine Effinity 93 natural gas unit heaters and American Coolair fan boxes. The control technology is all Wadsworth Control Systems. Colorado State University’s 65-year-old W.D. Holley Plant Environment Research Center has been replaced with a new $7.5 million 27,000-square-foot research and teaching facility. The 21,000-square-foot greenhouse is divided into six bays. All of the bays are connected by a ventilation corridor that has a 20-foot high gutter line. One bay will contain a Crop King NFT trough system consisting of six modules. The other half of the bay will be equipped with a traditional raft culture set up that has six 5-foot by 10-foot rafts. In December 2014, Ron DeKok, North America director of business development, Philips Horticulture LED Solutions, visited Newman to discuss supporting LED research at Colorado State. “Ron visited me on the same day I was given permission to talk about the budget for the center,” Newman said. “The timing was perfect. He asked me what kind of LED research CSU wanted to do and I asked him how committed Philips was to supporting LED research at the university. He said let’s equip the facility with Philips lighting and we’ll do research projects together. Newman said it hasn’t been determined yet how much of the greenhouse space will be dedicated to ornamental and vegetables crops. Steve Newman, who is Colorado State’s greenhouse crops extension specialist and professor of floriculture, said the new horticulture center will be used for research, teaching and training. “I expect the research is going to be about 60 percent ornamentals and 40 percent vegetables, but that could change,” he said. “Initially the greenhouse vegetable production will be used primarily for teaching and demonstration. We will get into the vegetable research later. 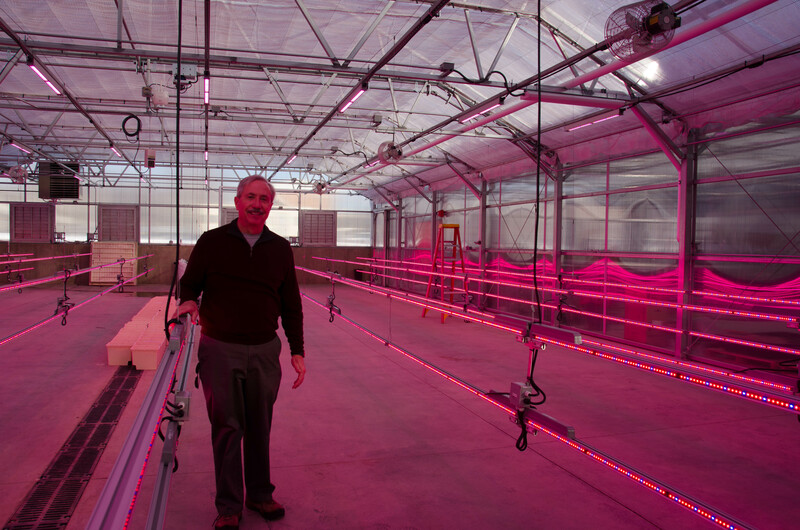 Newman said fellow researcher and horticulture professor Bill Bauerle is planning to use the greenhouse’s corridor to study hops production using LEDs. “Northern Colorado is becoming a central location for craft breweries,” Newman said. “There is a lot of interest in locally grown hops for the craft breweries. Newman said that Philips has some of its own research agenda items that it would like to study in the horticulture center. “The research that the company wants to do is not that different than the research that we want to do,” he said. “What Philips is planning to look at fits in with everything else that we are doing in many ways. The company will be making some specific requests. The company will be funding those project directly just like any other research program. Philips Lighting has some of its own research items that it would like to study in Colorado State’s horticulture center, but the research is not much different than what university scientists want to do. Newman said that Philips is interested in looking at vegetable production for the warehouse farming market, which it refers to as its city farming program. “Unfortunately we don’t have the type of facility set up to do the warehouse style growing on site,” Newman said. “I would like to see us go into that type of production eventually. Initially with our vegetable crops we will look at biomass production. We will be putting in NFT lettuce trials. Newman said he is in negotiations with the university’s dining services department to produce vegetables for its dining centers. “I am in negotiations with dining services, which is looking to start vegan salad bars in the dining halls,” he said. “Dining services wants to put in salad bars with as much produce as possible grown in Colorado. They would like to have a certain percentage of that produce be CSU student grown. We are going to redo our student farm to try to accomplish that during the growing season. We will also be trying to grow as much of the leafy greens in this new facility to provide to the dining services’ salad bars. For more: Steve Newman, Colorado State University, Department of Horticulture and Landscape Architecture; (970) 491-7118; Steven.Newman@ColoState.edu. Photos courtesy of Steve Newman, Colo. St. Univ. Houston, Texas, June 25, 2015 — Indoor Harvest Corp (OTCQB:INQD), through its brand name Indoor Harvest™, is a design build contractor, developer, marketer and direct-seller of commercial grade aeroponic and hydroponic fixtures and supporting systems for use in urban Controlled Environment Agriculture and Building Integrated Agriculture. The Company is pleased to provide an update on the Pasadena, Texas Community Located Agricultural Research Area (“CLARA”) project. On March 31, 2015 the Company announced the signing of a LOI with the City of Pasadena, Texas to fund the establishment and provisioning of an indoor agricultural facility (vertical farm) to be located in Pasadena, Texas. Under the LOI, the City was to provide Indoor Harvest, or a partner of their designation with City approval, with two facilities owned by the City for the sum of ten dollars ($10.00) per annum for a period not to exceed twenty (20) years as well as provide tax abatements on these properties for use in a CLARA project. In addition, the Pasadena Second Century Corp. (economic development entity for the City of Pasadena) has been asked by City officials to consider a budgetary proposal of $500,000 as seed money for the project’s economic development portion in north Pasadena. The CLARA project, based on current negotiations, is expected to be divided into two phases. Phase One will focus on developing the non-profit aspects of the project and is envisioned to include the construction of a 6,000 sq. ft. vertical farm R&D facility and 6,000 sq. ft. of classroom and office space. Phase Two is envisioned to support a commercial retail operation with greenhouses built on approximately two acres of land adjacent to the vertical farm and education centers. The Phase One vertical farm facility is intended to serve dual roles, with Indoor Harvest using the facility as a demonstration farm and R&D facility and Harris County BUILD Partnership, a non-profit group, using the facility for educational and charitable purposes. It is anticipated that the crops grown will be donated, or sold at cost, to provide fresh produce to low income families in the North Pasadena area. The entire proposed campus area, almost two city blocks, will be designed and built to allow the flow of tourists without impacting operations. The City has been asked to develop a project overview to be presented in August to department heads at the Pasadena Independent School District’s Kirk Lewis Career & Technical High School and the Continuing and Professional Development Department of San Jacinto College regarding academic curriculum development to be located at the CLARA campus. The Harris County BUILD Partnership was established in January 2015 to eliminate the conditions that cause food insecurity in north Pasadena by launching a new healthy, accessible, and community-supported local food system. The conveners of the BUILD Partnership are the Houston Food Bank, the Harris County Public Health & Environmental Services (“HCPHES”) and The University of Texas MD Anderson Cancer Center. Additional members of the BUILD Partnership include CHI St. Luke’s Health, Memorial Hermann Health System, Brighter Bites, CAN DO Houston, City of Pasadena, Neighborhood Centers Inc., Pasadena Health Center and the U.T. School of Public Health. The BUILD Partnership is an extension of Healthy Living Matters (HLM), a county-wide collaborative of over 80 organizations chartered in 2011 to address childhood obesity in Harris County. There is also a Pasadena-specific version of HLM called the HLM-Pasadena Community Task Force that has 23 members local to the Pasadena community. On June 9, 2015, the Harris County BUILD Health Partnership was selected as one of seven projects out of over 300 applicants nationwide, to receive a $250,000 grant from the inaugural BUILD Health Challenge class. The announcement was made live from the National Press Club in Washington, D.C., featuring Karen DeSalvo, Acting Assistant Secretary for the U.S. Department of Health and Human Services and was followed by a congratulatory letter from LaMar Hasbrouck, MD, MPH and executive director of the National Association of County and City Health Officials who remarked, “I look forward to tracking your progress and learning more about your projects’ best practices and challenges.” A portion of this grant funding will be used towards setting up the academic and non-profit portion of the CLARA project. The Phase One initial project meeting has already been held. Caleb Harper, the Principal Investigator and Director of MITCityFarm, attended the meeting. As part of the non-profit academic portion of the CLARA project, all research would be made open source. The MIT Media Lab’s Open Agriculture (OpenAG) Initiative seeks to make agricultural research and data more available to researchers through an innovative cloud based system. Indoor Harvest is excited to continue its relationship with MITCityFarm by looking at ways to deploy the Open Ag platform at the CLARA research facility. Chris Higgins from HortAmericas, a company involved in horticulture product distribution, consulting and services, also attended the meeting. Indoor Harvest has selected HortAmericas as a project consultant to the CLARA project. HortAmericas will assist the project by evaluating methods and process and providing feedback through the design phase as well as assisting in preparation of standard operating procedures. It is expected that the project MOU will be finalized and property lease executed by August 2015 based on an existing timeline provided by the City. Construction on Phase One is planned for completion June 2016. Phase Two of the project is anticipated to be developed on two acres of land currently available adjacent to the existing properties being provided by the City. Indoor Harvest, as the primary developer of the campus, expects to be able to provide commercial operators who build on the CLARA campus a unique group of incentives and key advantages in regards to distribution, manufacturing intelligence and access to resourcing and key agricultural production talent. Phase Two timeline will be dependent upon securing commercial partners who have adequate funding and approval by the City. The Company is currently in talks with several commercial parties interested in building on the CLARA campus. In addition, the City of Pasadena is currently considering creating a tax increment reinvestment zone (TIRZ) in the immediate area surrounding the CLARA campus. A TIRZ is a public financing structure that Texas law allows to target tax revenue helping to support redevelopment in underserved areas. Such a zone, if created, could provide an additional economic incentive for tangential services to locate on the project site. As of now, the City is not obligated to create a TIRZ zone and no such zone may ever come to fruition. Indoor Harvest Corp, through its brand name Indoor Harvest™, is an emerging design build contractor and OEM manufacturer of commercial aeroponic and hydroponic system fixtures and framing systems for use in Controlled Environment Agriculture and Building Integrated Agriculture. Our patent pending aeroponic fixtures are based upon a modular concept in which primary components are interchangeable. We are developing our aeroponic and hydroponic systems for use by both horticulture enthusiasts and commercial operators who seek to utilize aeroponic and hydroponic vertical farming methods within a controlled indoor environment. Please visit our website at http://www.indoorharvest.com for more information about our Company. This release contains certain “forward-looking statements” relating to the business of Indoor Harvest and its subsidiary companies, which can be identified by the use of forward-looking terminology such as “estimates,” “believes,” “anticipates,” “intends,” expects”and similar expressions. Such forward-looking statements involve known and unknown risks and uncertainties that may cause actual results to be materially different from those described herein as anticipated, believed, estimated or expected. Certain of these risks and uncertainties are or will be described in greater detail in our filings with the Securities and Exchange Commission. These forward-looking statements are based on Indoor Harvest’s current expectations and beliefs concerning future developments and their potential effects on Indoor Harvest. There can be no assurance that future developments affecting Indoor Harvest will be those anticipated by Indoor Harvest. These forward-looking statements involve a number of risks, uncertainties (some of which are beyond the control of the Company) or other assumptions that may cause actual results or performance to be materially different from those expressed or implied by such forward-looking statements. Indoor Harvest undertakes no obligation to publicly update or revise any forward-looking statements, whether as a result of new information, future events or otherwise, except as may be required under applicable securities laws. a PhD in plant science. speak to a group of college students during what is formally known as “seminar”. Informally, it is known as nap-time! could do this without leaving your office. You can learn more about STEM, here. repeats, so students can remain enrolled in the class over multiple semesters. knows, perhaps one of them will become one of our industry’s next leaders. You never know. Article written by Hort America’s Technical manager, Dr. Johann Buck. benefits of grafted plants. Field growers are quickly learning them too. benefits grafting has to offer. produce marketable fruit is the scion. vegetable crops that are being grafted is steadily climbing. grafted plants and the one using them. traits from one plant to another and the possibility that bad traits tag along. grafted plants to heal before they are ready to transplant. less than ideal growing conditions. grafted plants until they are confident people will buy them. production systems is much more common outside North America. occasionally inconsistent performance may explain the situation,” Kleinhenz said. field and high tunnel production. prepared as experience and research-based information become available. related to profit, resource efficiency and sustainability. opportunities associated with preparing and using grafted vegetable plants. widen the application of vegetable grafting as cornerstone technology. 4. Describe the USDA-Industry Team’s goals and approaches.